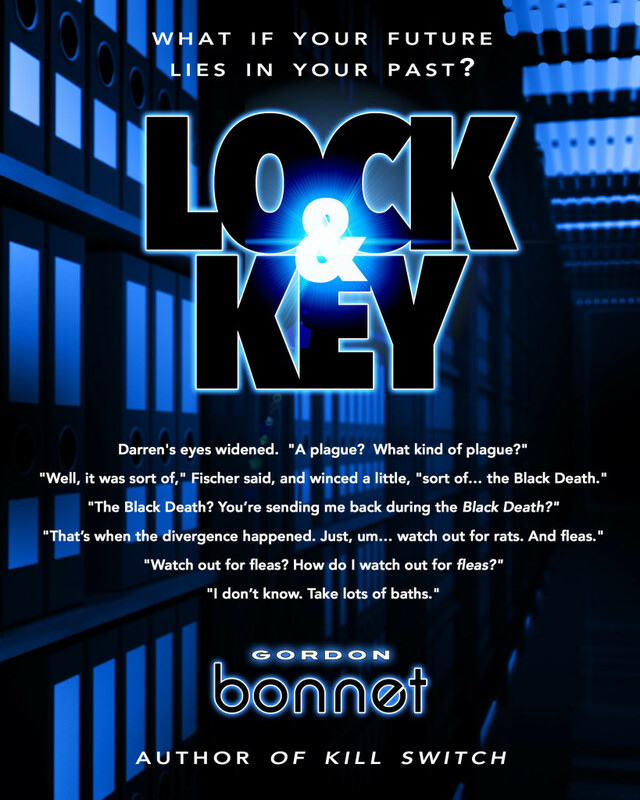 I recently took the time to read Lock & Key by Gordon Bonnet. While I don’t typically write science fiction (I’ve written a short story or two, but not a novel—well, not yet, anyway), I do enjoy reading it. I’m often leery about an unknown author in this genre, because if the storyworld isn’t properly developed, if the details of the fiction aren’t well-thought out, then the story won’t seem real and it’s a disappointing read. Well, I don’t know if you’ve heard of Gordon Bonnet or not, but if you haven’t, pay attention. Last year, I read a book of his called Kill Switch, and from the first page I knew I’d want to read all of his work. 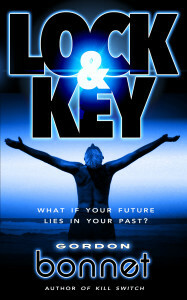 So when Lock & Key came out, I immediately added it to my to-be-read list. It didn’t disappoint. In fact, it thoroughly impressed me. Lock & Key takes place in the present. Sort of. Well, that’s where it starts. Protagonist Darren Ault is an unassuming bookstore owner who, after an ordinary day, meets his best friend, Lee McCaskill (a brilliant scientist) for an ordinary dinner. Then the extraordinary happens. Lee shoots Darren in the head. Darren doesn’t die. Instead, he’s whisked to the Library of Timelines, where the Head Librarian and his administrative assistant are more than a little upset that things have transpired the way they have. Not only did Darren survive the shooting, the rest of the world has vanished. The Head Librarian researches the problem and discovers there were three places in the past where timelines diverged, possible places where Darren can make things right and reset the balance of humanity. With seemingly no other choice, Darren begins a journey through time and history to right the wrongs of temporal disorder and bring humanity back into existence. So, like I mentioned earlier, if the intricate details of the science fiction world aren’t thoroughly considered, the story can fall apart. But Bonnet did a wonderful job of thinking through all the possible problems and pitfalls (and we all know time travel presents a lot of them) and providing the reader with a story that not only logically flows, it thrills. Each era and locale visited evokes images of what those times were really like. Readers smell the odoriferous scents, hear the sounds of nature, taste the bland local cuisine. We’re transported there right along with Darren. And when he’s back at the Library, we’re treated to witty banter and technological wonders. All this while seamlessly advancing a wonderful plot that keeps the reader rapidly turning pages. I read the whole novel in one sitting. I thoroughly recommend Lock & Key by Gordon Bonnet. The characters are three-dimensional, the plot is well-developed, and the settings are rich and tangible. If you love sci-fi, you don’t want to miss this novel. And if you’re new to the genre, this is a great one to start with. Not my normal genre, but I do enjoy a good read. Sound interesting. Time travel can influence many things. Michele, I know you like the weirdness that is Stephen King. Let me just say that you’ll love Gordon’s brand of strange. I’ve read two of his works now, and both captivated me. I’m looking forward to reading this. It’s the kind of sci-fi I like….not robots or alien civilizations but a lot of speculative mix tossed in to make you think. I’m also a huge fan of time travel when it’s done well. Definitely on my TBR! Then you’ll definitely like this one, Mae. Gordon masterfully handled the conundrum of time travel while letting the characters drive the story. I’m glad you’re going to check this one out. You won’t be disappointed. I’m not a big Science Fiction fan, but the possibility of time travel intrigues me. Sounds like an interesting book. It doesn’t read like Borgs and blown up planets, Joan. It’s really character-driven. A really good read.